The city of Amsterdam is world famous for its museums. For culture lovers, The Museum Quarter (‘Museumkwartier’) is definitely the place to be in Amsterdam. The three major and best known museums in Amsterdam are situated very near to each other. 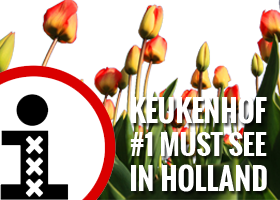 This prestigious area is home to the Van Gogh Museum, Rijksmuseum and Stedelijk Museum. 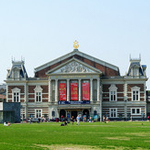 All three museums are located on the Museum Square (Museumplein). Together with the world famous Concert Hall (located south of the Museum Square) makes the Museum Quarter a real sophisticated area. The main hall (‘Grote Zaal’) of the Concert Hall can seat up to 2.000 persons and is international recognized for its great acoustics. In this area, Coster Diamonds is located as well (between the Van Gogh Museum and the Rijksmuseum). It offers free guided tours showing the process of polishing and cutting diamonds. Not far from the Museumplein the P.C. Hoofdstraat offers a wide range of the world most chic and exclusive fashion labels (Louis Vuitton, Chanel, Gucci, Hermès and more). It is one of the most expensive shopping streets in The Netherlands. The street was named after Pieter Corneliszoon Hooft (1581–1647), a Dutch historian, poet and playwright. In 2012 a secret survey of 30 world-famous shopping streets ranks the P.C. Hooftstraat in Amsterdam 3rd best shopping street in the world! Centrally located in the middle of the city; The ‘Vondelpark’ is the largest and most popular park in Amsterdam. It welcomes 10 million visitors per year with many tourists and locals among them. On a sunny day the park is packed with people roller skating, jogging, laying in the grass and having a picnic or BBQ. In 1865 the park opened to public and was named ‘Het Nieuwe Park’ (New Park). After a statue of writer and playwright Joost van den Vondel was placed in the park in 1867, people started to call it the ‘Vondelpark’. 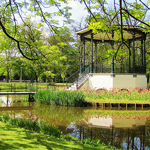 In the park you can find a few cafés and restaurants like ‘Het Groot Melkhuis’ and ‘De Vondeltuin’. They both have a large playground, fantastic for children. Another popular spot is ‘Het Blauwe Theehuis’ with a large terrace. In the summer dance performances, theater and music is played at the ‘Open Lucht Theater’ (Open Air Theater). Admission is free, but the best thing to do is to make an on-line reservation on their website (fee EUR 2, 50), since most of the shows are very popular. Large field next to the museums; also used for festivals and open air concerts.